Each year, wooden floors evolve and new trends emerge in the industry. It is important to keep up to date with the newest innovations and installation techniques. Moreover, it is important to know what the consumers really want on their floors.The wood natural look tends to quickly gain in popularity. The refined staircases, the interlinked wooden and ceramic floors, the usage of reclaimed wood and of chevron–shaped wooden slats are increasingly gaining in popularity. The staircases often occupy the property central space. The modern look and the minimalist trend are gaining in popularity a lot with the homeowners. They are looking for more clarity and for the natural aspect of the wood in their structure. The wood species that are trending are the walnut, the white oak and the caryer. The riser tends to be left out to give the structure a more open look. However, if it is not possible for the riser to be omitted, the trend is to give it a white tint, thereby creating a nice contrast with the step which is left to its natural look. To get ideas from this trend, click here. That floor type, very popular this year, is used to create a soft transition between a wooden floor and a ceramic floor. Often, it is used in the kitchens and the bathrooms. The ceramic zone is installed near the sinks, patio doors, showers and baths to give the surface a higher water and humidity resistance. This installation technique tends to cause some difficulties, but will give the room a unique, durable and aesthetic look. To see pictures of this new trend, click here. The usage of reclaimed wood is another big trend. From floors to furniture and to walls, this trend has been going for a long time and should not slow anytime soon. More and more, the environment tends to take a bigger place in the consumer’s mind. It is therefore relevant to suggest to your customer to transform their old wooden planks (barn wood, wooden pallets, ect.) in a new floor that will give a rustic and a warm atmosphere to their rooms. To see what a reclaimed wooden floor looks like, click here. The most recent trend that makes a strong come back in the wooden floor industry is the chevron-shaped installation on the wooden slats. That technique gives countless possibilities. In order to create the desired effect, it is possible to mix the different wooden species, width and colors of the wooden slats to create creative design. To get inspired by this trend, click here. 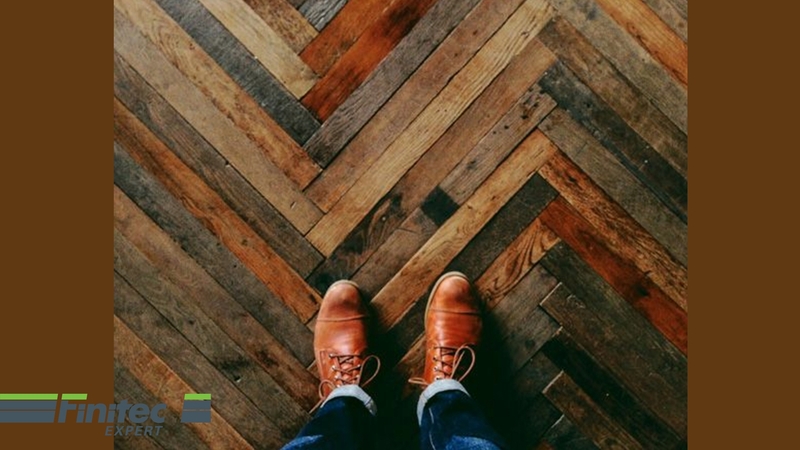 After using those different techniques and/or material, it is important to adequately protect your wooden floor so that they last for a long time! The floor’s luster level trends are to a matte or satin look. These finishes allow your floors to keep their natural look. To learn more on the Finitec Expert water-based finishes, click here.